New & Digital Media Artist / Scholar / Researcher / Media Art Specialist / Associate Professor, Department of Cultural and Creative Arts, The Education University of Hong Kong / Director and Founder of innov + media lab (imhlab) / MA @ Central Saint Martins College of Art and Design (UK) / Research @ ZKM (Germany) / PhD @ The Planetary Collegium, Zurich University of the Arts (Switzerland) & University of Plymouth (UK), supervised by Prof. Dr. Jill Scott and Prof. Dr. Thea Brejzek. Dr. HUNG’s innovative practice involves working and researching across a range of media, including interactive performance, moving images, photography, experimental ink painting, installation and writing, etc. Alongside his individual practice and research he also leads a research lab ‘ imhk lab’ focus on new media art and design practice in research relation to Chinese philosophy and interactivity, which began in 2005. Dr. HUNG studied in the Swire School of Design, Hong Kong Polytechnic University; Chinese University of Hong Kong and Central Saint Martins College of Art and Design, London, United Kingdom with a MA in Film and Video; visiting scholar at the Center for Art and Media (ZKM), Karlsruhe, Germany. 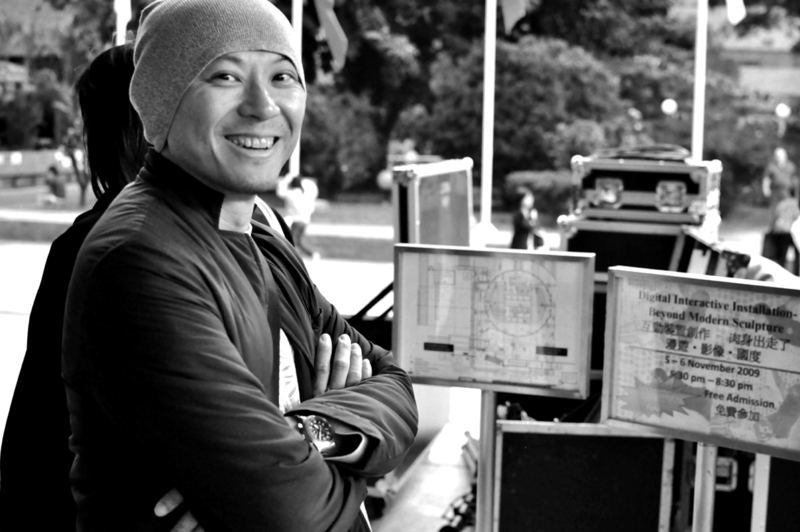 HUNG Keung is currently Associate Professor of The Education University of Hong Kong and completed his Ph.D (Digital media art & Chinese philosophy) of the Planetary Collegium, Zurich University of the Arts, Zurich, Switzerland & University of Plymouth, United Kingdom. In 2005, HUNG Keung founded innov+media lab (imhk lab), focuses on new media art and design research in relation to Chinese philosophy and interactivity, making bridges between people regardless of their nationality and capability through his series innovative & interactive Chinese characters workshops with media art technology. Hung Keung (b.1970, Kunming, China) is a new and digital media artist and scholar. His innovative practice encompasses interactive performance, installation art, experimental ink painting, photography, moving images and writing. Intrigued by the interconnectedness of time and space, as well as between the viewer and the work itself, his latest works incorporate moving digital images to explore human limitations and attempt to extend them using technology. 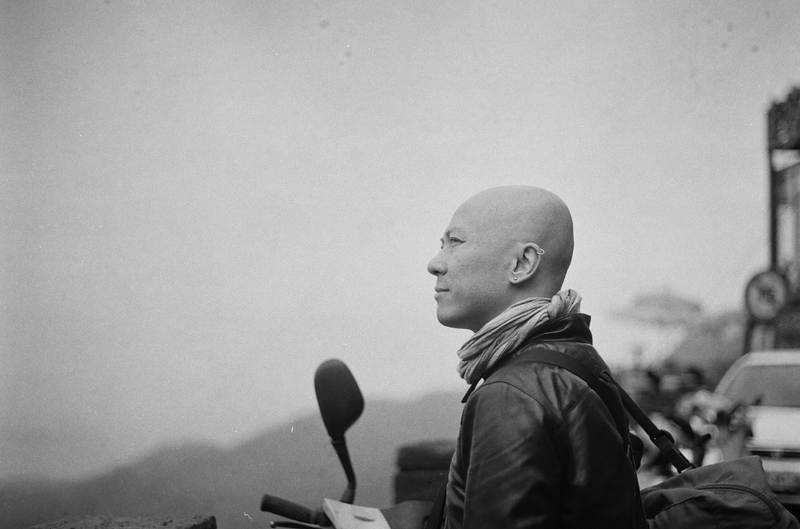 Hung Keung’s solo exhibitions have been held at Art Basel Hong Kong (2013); Chinese Arts Centre, Manchester, U.K. (2012); Jordan Schnitzer Museum of Art, Eugene, Oregon (2011); among others. He has also exhibited in various group exhibitions globally including: ITÄ-AASIAN VIDEOIKKUNA/East Asian Video Frames-Shades of Urbanization, Pori Art Museum, Finland (2016); INK REMIX: Contemporary Art from China, Taiwan and Hong Kong at Canberra Museum and Gallery, Australia (2015); and Conforming to Vicinity—A Cross-Strait Four-Region Artistic Exchange Project in Macau, Taiwan, Shenzhen and Hong Kong (2014-2015). Hung’s videos and interactive art have received the Prize of Excellence at the Hong Kong Arts Biennial in 2001 and the Hong Kong Contemporary Art Biennial Achievement Award in 2009. Alongside his individual practice and research, he leads “imhk lab”— a research lab he founded in 2005 that focuses on new media art and design research in relation to Chinese philosophy and interactivity. Hung is also an Associate Professor at the Education University. In recent years, my focus has been in philosophical exploration, research on technology and artistic creation. Often I am asked, the reasons behind my deep interests in Chinese characters and calligraphy, as these areas seem to have little connection with digital media creation. This question also arises my own interests. So, I would like to look back on my journey of art creation, to see if I can find any hint between traditional and digital art. My first encounter with traditional Chinese paintings and calligraphy was at the age of seven. I did not get these knowledges from school but from my mother. When I was young, I can be classified as an overactive child. I can either be absorbed completely or in the other way round, be extremely active. A “classic” example my mother often mention happened like this: one day, my mother go to my primary school to pick me up, but I were nowhere to be seen. My mother guessed that as usual, I was held in detention by teachers. So, she went to my classroom. What she saw after she opened the door is a scene she cannot forget – me jumping from desk to desk at my classroom! I do not know if example like this triggered the idea for me to start learning traditional Chinese arts, but I do remember the day when she taught me traditional Chinese painting for the first time. She had me sat beside her, drew a pine tree and told me to draw as she did. The one thing that impressed me most is painting bamboos. Due to the diversity of bamboos, she skillfully introduced me to the trunk first, then the structure and the centre of gravity. At last, she sketched out the leaves to finish the painting. Even after thirty years now, the scene is still so vivid in my mind. After bamboos, there came red-crowned cranes, one at each side of a pine tree. Being a child of only six or seven, drawing this picture was a grand project for me and I was very excited. It was like entering a fantasy world for me. My mom took me to a master of stamp-craving, my name become “three-dimensional” after I got the stamp. She even got me a red mud print although the whole thing is not meant to be serious. After 20 years, in The Chinese University of Hong Kong (CUHK), I started to learn the relationship between historical materials, words, papers, space and stamp. Back then, I got a series of stamps of my name handcrafted by myself. At that time, there is no western or eastern creative media to me. As there are traditional drawing materials and tools at home, I started to draw ink paintings. My mom surprised me again by showing me the way of writing an upper section and a lower section. She recommended that I should also put my personal stamp on it. I remember learning and observing quietly and then tried to practice everything I learnt. However, my interests shifted to comics quickly and produce a lot of unfinished comics. I used the name “艇仔粥 ” as my stage name , working and studying at the same time throughout the first few years of my secondary school. Since then, I did not have the chance to pick up traditional Chinese ink painting and calligraphy again. It was not until I was admitted to the Department of Fine Art of CUHK that I discovered they offered calligraphy and ink painting as basic training subjects for undergraduate students. I knew that I would most probably chose western media as the direction of creation for my graduating work, as a result, I would like to take as many subjects relating to Chinese media in the first two years of my undergraduate study. Throughout those years, I was very lucky to meet a lot of professors who influenced me positively during my road of art creation. Both part time and full time professors possess a sense of humanity that I was not able to find outside the university. By staying beside them, I felt their self-possession and creative wisdom. Although my graduation work is in western media, but when I created my installation art, I tried to add the element of Chinese writing brush. I used the technique of 工筆畫 (Gung Bat Waa) outlined my figure of me playing Tai Chi, then use silk screen printing to print on a series of mirrors. As a result, a graduation artwork with a combination of Tai Chi, Gung Bat Waa, silk screen printing and video recording was born. Actually I am not that happy with the content and quality of the work, there were still a lot of problems for me to solve. My trip to UK, not only enhanced my knowledge on Chinese ink painting, I was also brought closer to it again. After I graduated from CUHK, I went to UK to study on short films and video art. During my last year in CUHK, I started to know about video art and created a few experimental works. When I studied in UK, I treasured the space and equipments provided by the institution. I insisted to go to school to work every single day. It took me 2 hours every time just to get to school. Looking back into this, I now realized I did not have enough preparation on my study in UK. I wanted to learn more and work more but in reality, I simply did not have enough money to sustain my life in UK. I ran out of money in 3 months even before I paid my tuition fee. The school administration discussed with me in depth about my situation. They suggested me to explore my choices carefully. I can still study and join exams in school, but the school administration will put my academic results on hold until I paid my tuition fee. I appreciated so much on the generosity of the school. However, reality is cruel. When I saw my near-zero balance of my bank account, I knew I have work on whatever I can do. I tried my luck in restaurants in the China Town. Eventually, I decided to be a painter on tourist spots in London. After having eggs as lunch for 2 weeks, my life as a street painter started. Most of other painters worked on portraits. To my observation, works of Chinese painters were generally better. Chinese painters were also more popular. The tourists are willing to spend an hour or two for a painting. The prices of the portraits ranged from 15 pounds to 25 pounds. I decided to try to use 工筆人物畫 (Gung Bat Jan Mat Waa) plus Chinese ink paintings skills to paint portraits of tourists. I charged for 5 pounds per painting. Although it did not bring me a steady income, I was happy to put what I have learnt into use. It also brought me great memories. Unfortunately, I have to spend time on short films, videos, new media research and also a biennial so I could not spend time on Chinese ink paintings and calligraphy. Those were the days到了2006年，那年有三件事情令我感受什深，直接啓發了我對中國書畫和數碼媒體藝術館雙年展的𨶹係。In 2006, there were a few things happened that impacted me greatly. They inspired me on the relationship between Chinese ink paintings and calligraphy digital media museum biennial. Spring 2006: I was awarded a scholarship from the Asian Cultural Council for me to go to US on media art research and exchange. The United Nations released a statement suggested China organized the use of Chinese characters and confirm the Simplified Chinese characters as official language. Thus, when foreigners learn to read and write Chinese, they should be using Simplified Chinese characters. However, I do not think this will be the case. Summer 2006: I was invited to visit the Shanghai Zhangjiang Hi-Tech Park and created a digital artwork. When I was there, I saw that many old buildings were demolished and replaced by high rise buildings. Inside these buildings are mostly new technology company, like companies that produced animation softwares. I remembered one time, the visiting team leader took another another artist 徐恆 (Xu Heng) and I to the roof top of a high rise building. We had a birds eye view of this area and it seemed vast and borderless. The person-in-charge eagerly introduced to me that this was an old residential area and how rapid it would develop. I listened to his introduction and on the other side, my mind drifted off to the way people lived here before the demolition. On one hand I was proud that my home country has the vision to develop new technology, on the other hand, I could not help but felt a sense of pity. 就此我便創作了一系列以簡體字和繁體字的互動媒體作品，目的透過兩個互動影像去令參與者親身感受一種模棱兩可的香港人身份特徵！作品是在上海外灘三號的沪申畫廊展出。一方面，我們以身位中國人為榮，另一方面，我們又似乎很不滿在中國發生的一些事情。一種愛之深，恨之切的感情油燃紙上，也正是這互動作品想帶出的情懷。之後，我那互動數碼中文字也影響到我另外的 [道生一 ] 系列 ( Dao Gives Birth to One) 的創作方向，就是想把中國哲學裡 的“道” 和宇宙萬物的關係，以數碼互動媒體去演繹一次。內容有涉及中國長卷軸畫的時空慨念，亦有賞試探討畫紙空間的留白和數碼虛擬空間上的白色慨念相互關係，成績可能未必完全美滿，但凡此種種，令我這代在數碼世界的新(又是舊)人纇， 在努力地迎接未來時，也重新審視自己的文化及成長過程，是如何重要及不可分割地影響著自己的創作方向和思維方式。這體驗其實看似老生常談，但如要運用在媒體藝術創上， 必態還也是要戰戰兢兢地一步走著，一步看著。! 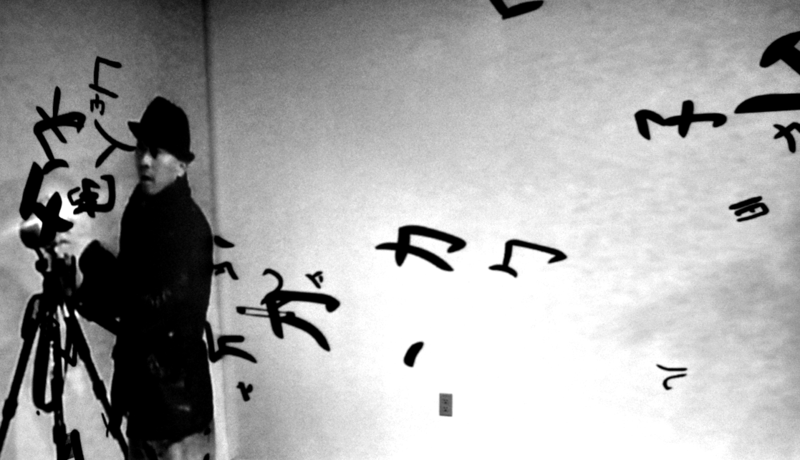 Autumn 2006: I created a series of interactive media works featuring both Simplified and Traditional Chinese characters. The purpose of the work is to enable participants to experience an ambiguous identity of Hong Kong people through two interactive images in real time. The work was displayed in a gallery in Shanghai Bund. I was proud to be a Chinese but I was not happy about certain things in China. Love well, whip well – this is exactly the core value of the work that I wanted to brought to the audience. Afterwards, my interactive Chinese characters influenced another series of my work – Dao Gives Birth to One. The purpose of this set of works is to displaced by interactive media about “Dao” in Chinese philosophy and its relationship with the Universe. In included the sense of time and space in Chinese scrolls. Contents included the sense of time and space in Chinese scroll. it also included discussion of the interaction of vacant space on paper-based art work and the idea of white in digital virtual space. The results may not be completely satisfactory, but all these may make my generation, who live in the digital world, re-examine that our culture and growth process, is so indispensably influencing our creative direction and thinking process. This experience may seem like a cliché, but using it in the creation of media art, we would have to wait and see. This entry was posted in HUNG Keung. Bookmark the permalink. 2 Responses to Hello !